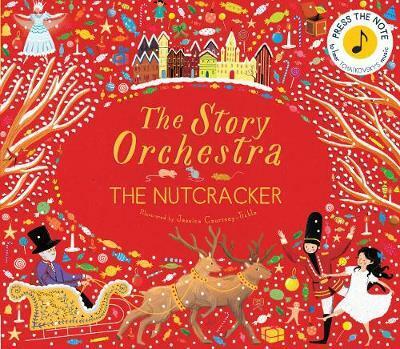 This is a stunning musical journey into the land of The Nutcracker. With special press buttons throughout, children can follow the story and actually listen to excerpts from Tchaikovsky’s gorgeous orchestral music. This book is so beautifully and cleverly designed. It tells a classic tale but with gorgeous illustrations by Jessica Courtney-Tickle and “press here” buttons on each page that let children experience the magic of the music that brings this story to life. I’m sure many of you know the story behind the classic ballet. Young Clara is given a nutcracker as a Christmas present by her strange Uncle Drosselmayer and her naughty little brother breaks it. That night, the nutcracker turns into a prince and takes Clara on a magical adventure to his kingdom. I just love how the music is so beautifully integrated into the story. On each page, a short, yet well-known excerpt of music can be played. From the dance of the sugarplum fairy to Clara’s dream of fighting the mouse king, each piece of music is different and creates the mood of the story. My eight and 10 year olds were entranced by this book. On listening to the music, they recognised several of the excerpts but didn’t know where they had heard them. It was a great learning experience for them to understand that all of these pieces of music were written by Tchaikovsky for this wonderful story. At the end there is a short summary of Tchaikovsky’s achievements and all the music buttons again on one page with descriptions of each piece. We spent a lot of time just listening to each music excerpt at the end with the kids guessing what part of the story it related to. It was a fascinating way for them to tune into the mood of the music and think about how it fit with the story. This is a lovely retelling of The Nutcracker. Integrating music into a visual picture book is a great way to introduce children to the wonders of music. In most picture books, the words and images have to work together to create a whole. The addition of the music adds another layer of meaning to the story. This book is well thought out and beautifully presented.